We love this easy weeknight dinner using rotisserie chicken. Prepped and ready to go within 20 minutes! 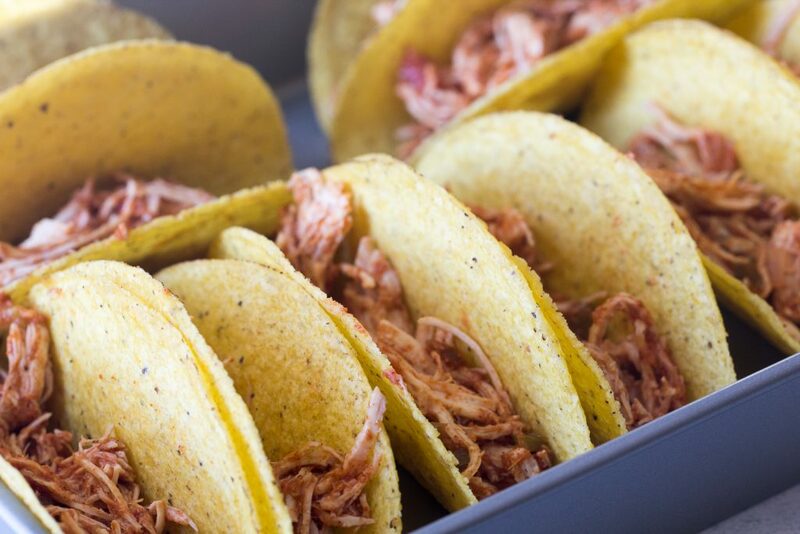 These Oven Baked Chicken Tacos will quickly become a favorite on your meal rotation. Taco Tuesday is often celebrated at our house. And sometimes taco Monday, Wednesday, and Thursday. We can’t get enough of them! My family has always loved our Oven Baked Beef Tacos and I love how easy it is to make! 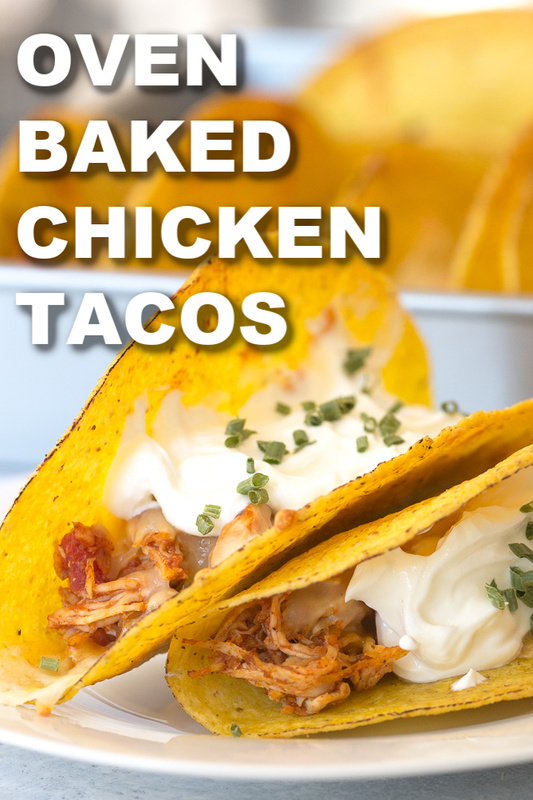 We decided to substitute the beef for chicken, and a brand new delicious baked taco was born. In a pinch to throw this together? Save yourself tons of time by using a rotisserie chicken instead of cooking and chopping your own! Most grocery store delis will sell freshly packaged rotisserie chicken pulled off the bone. If you’re local deli does not sell pulled rotisserie chicken, you can also buy a whole chicken and freeze what you don’t use for another time. 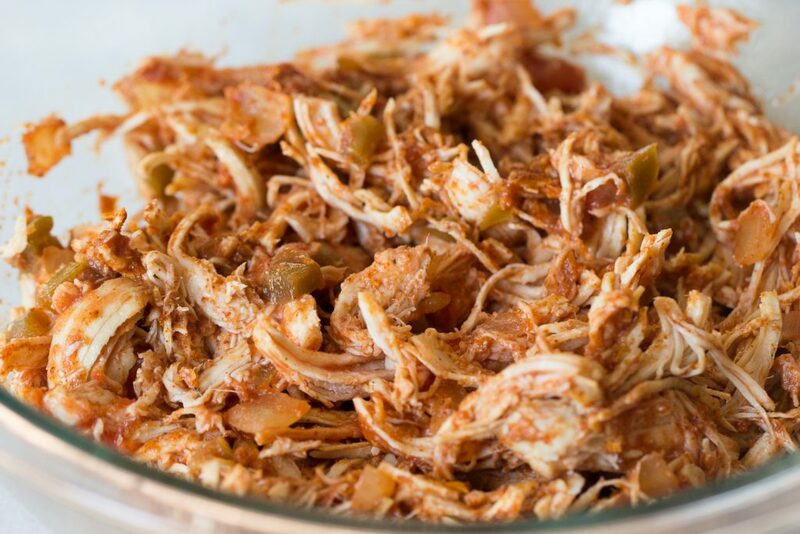 We use this shortcut in a ton of our shredded chicken recipes. In a large 9×13” baking pan, line up all of the hard taco shells so they are touching without falling over. Combine shredded chicken, salsa, and taco seasoning in a bowl. Homemade taco seasoning or store-bought work great here. 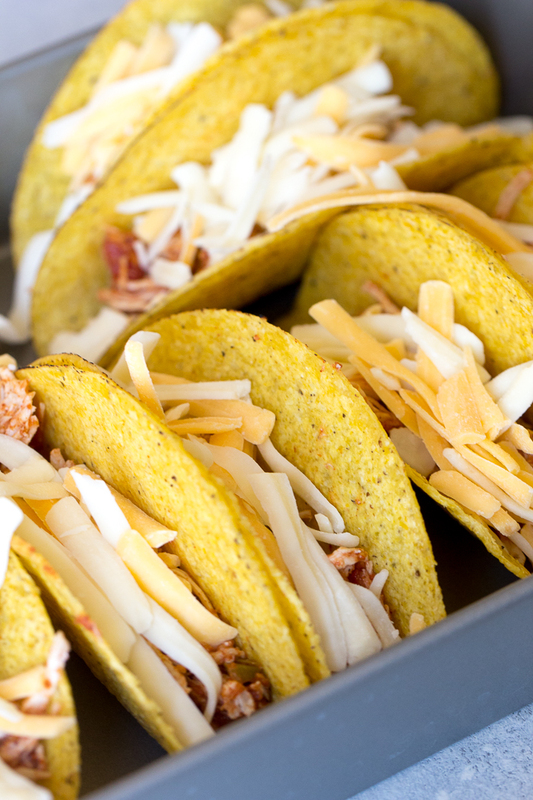 Spoon chicken mixture evenly into all of the taco shells and top with Mexican blend cheese. Bake for 10 minutes or until cheese has completely melted and chicken is heated through. Top with sour cream and your favorite taco toppings. We love avocado, tomatoes, black beans, olives, and cilantro! Feeding a crowd? This recipe can easily be doubled OR tripled. Just make sure to use a 9×13” rather than a cookie sheet to keep your tacos upright. We’d recommend not prepping these too far ahead of time however, because the juice from the salsa sitting too long on the shells could result in a soggy shell. Prep your chicken before hand and have your shells ready and then fill them up and pop them in the oven just before you’re ready to serve. In a large 9x13” baking pan, line up all of the hard taco shells so they are touching without falling over. 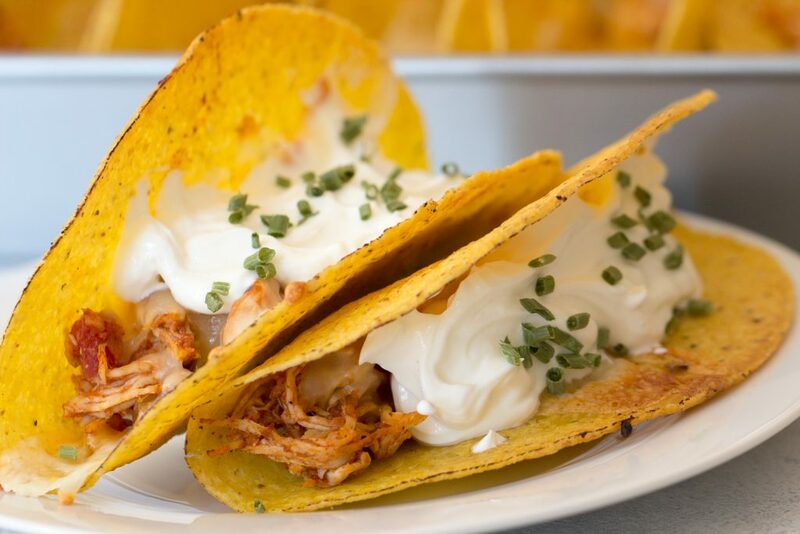 Top with sour cream and your favorite taco toppings. We love avocado, tomatoes, black beans, olives, and shredded lettuce. We’re showing you how to make our Oven Baked Beef Tacos in this video!